I’ve previously mentioned the significance of the Hungarian family favourite recipes passed down from my grandmother. 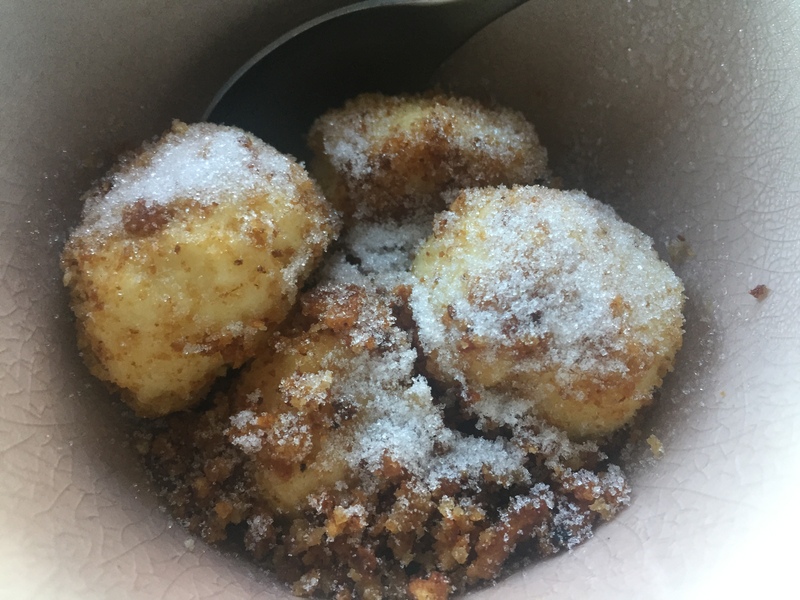 Túrós Gombóc*, basically curd cheese dumplings (I’m not sure of the exact translation), is another dish that my mother makes on special occasions, and the recipe was part of the essential family list she gave me when I left home. One of the main reasons for not making them often is that until relatively recently, farm cheese (itself a substitute from the Hungarian original I’ve later discovered) was difficult to get hold of, and there are no real substitutes. It’s a fresh white cheese, but drier than cottage cheese or ricotta, with a slightly more sour flavour. You will probably not find farm cheese at the supermarket, but most delis will have it – usually in blocks wrapped in cling wrap near the feta etc, or sometimes sold by weight near the fresh ricotta. I buy mine from Deli Cravings at the Belconnen Markets. Once you have the farm cheese though, it’s very simple, just combining the cheese with a few other ingredients and forming balls. These dumplings are then briefly simmered, and tossed in fried breadcrumbs that form a richly crunchy counterpoint to the tender, delicate dumplings. You will notice there is no sugar in the dumplings themselves. This is not a typo, they are made unsweetened and then you add sugar at the table – this may sound unusual for a dessert, but the result is quite addictive! Process cheese briefly until a rough puree, then add eggs, flour, semolina, 50g butter, lemon zest and salt, and process until smooth and thick. With wet hands form into small (walnut sized) balls. Simmer in salted water until they float and then for another minute or two until just firm. Remove with a slotted spoon and drain on kitchen paper. Fry breadcrumbs in extra butter until brown, add dumplings and toss until coated with crumbs and heated through. Serve with sugar and cream. Oh my! I want some! They look divine Beck. You’re right about the sour flavour. It’s quite unlike any other curd cheese. Makes delicious baked cheesecake too. I’ve been researching how you make farm cheese and it’s really rather a production. It used to be available in delis in Sydney wrapped in the sort of paper you sometimes find around ricotta and I found some in sealed plastic in a supermarket in Adelaide 40 years ago. I can’t get it on the Mid-North Coast. I can buy it quite easily in a few delis now, but didn’t you find a recipe for making the traditional cheese from scratch which was different again? These legacy recipes are such a wonderful resource, evoking so many memories, that they always going to taste better on the family dinner table than they possibly can anywhere else. Sadly, those of us from an anglo background don’t have so many culinary treasures to share. This recipe, so simple but with fried bread crumbs how can it not be delicious? And I think the Hungarians have done other wonderful things with farm cheese. If you take a spoonful of this same sort of farm cheese and semolina mixture, enrich it with brandy soaked raisins, and wrap it in a square of laminated yeast dough (croissant dough) you have (I think!) Túrós Táska, or hungarian cheese squares, which are as superb as any baked goods possibly could be! Quite tricky to make though, unfortunately, though the flavour profile is quite similar to this recipe, with the flaky yeast pastry taking the place of the crisp, buttery breadcrumbs. All delicious! Thank you for the recipe. The most recent recipe for farm cheese came from the blog of zsuzsaisinthekitchen, a Canadian woman of Hungarian background. It involves a lot of curd and whey separation in a slow oven. Incidentally, I sent it to Lyndall of The Cheese Making Workshop at Coffs Harbour, who tested it and found it good AND had it sanctioned by one of her staff who happens to be Hungarian! Oh, what a lovely family tradition to pass on down.